The National Oatmeal Day is celebrated every year on October 29. This food-related holiday is dedicated to one of the most popular breakfast cereals which is known for its health benefits. The word “oatmeal” refers to ground oat groats or a porridge made from oats. Oatmeal contains quite a lot of soluble fiber therefore daily consumption of a bowl of oatmeal can help lower blood cholesterol. Oatmeal also has high content of complex carbohydrates that stabilizes blood-glucose levels and encourages slow digestion. 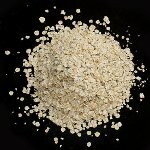 Oatmeal porridge also contains beta-glucans and B vitamins. Oatmeal porridge is a popular breakfast food in the United Kingdom (especially Scotland), the United States, Finland, Denmark, Norway, and Sweden. It is usually made from rolled or steel-cut oats, and water or milk. Nuts, raisins, nutmeg, and cinnamon are sometimes added. Oatmeal porridge can be served with butter, cream, maple syrup, or jam. Oatmeal is also used as an ingredient in cookies and pies. To celebrate the National Oatmeal Day, make some oatmeal raisin cookies. In a large bowl, stir together 2 1/2 cups flour, 2 cups rolled oats, 1 cup raisins, 1 cup white sugar, 1 cup brown sugar, 1 cup shortening, 3 well beaten eggs, 2 tsp baking soda, 1 tsp vanilla extract, and 1 tsp salt. Shape dough into 1 inch balls. Place on baking sheet, flatten and bake at 350 °F for 10 minutes.